National Institute of Electronics & Information Technology, formerly known as the DOEACC Society, is a society that offers information technology training at different levels. Stenographer: First Class Graduate from a recognized University/ Institution with shorthand speed of 100/ 80 wpm in English/ Hindi and Working knowledge of computers preferably NIELIT ” CCC ” or higher certification. Junior Assistant: First Class Graduate from a recognized University/ Institution with typing speed of 30 wpm in English or 25 wpm in Hindi with Working knowledge of computers preferably NIELIT ” CCC ” or higher certification. 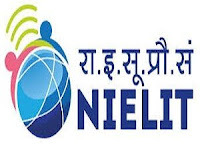 Complete the NIELIT Jobs Application Form with the essential data. Take a print out of NIELIT Recruitment 2018 online application form.